Brew of The Day: Check it out - Ber Month Sale at Aigoo Shoppe! Hey coffeeholics especially those who love wearing contacts, Aigoo Shoppe is having a Ber Month SALE. 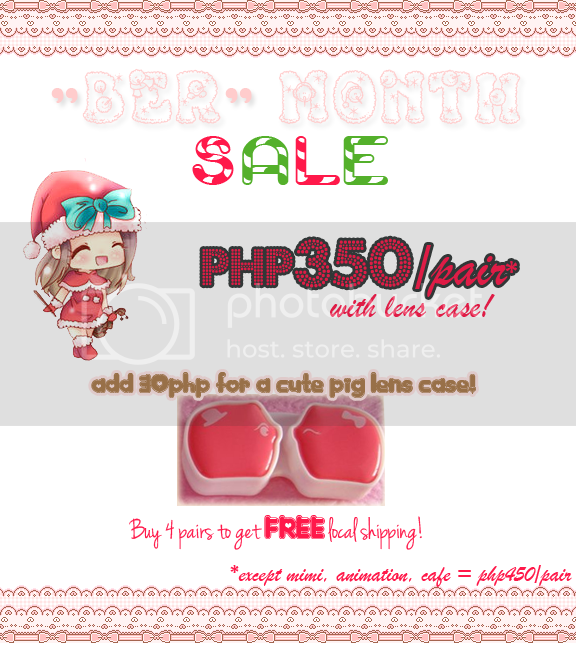 Get a pair of contacts with lens case for only Php 350! And if you buy 4 pairs to get FREE local shipping. I've bought and used her contacts before and absolutely love the Geo Contact Lenses (I bought purple of course! This was taken last year, I was wearing my purple Geo contacts here from Aigoo Shoppe! So if you are thinking of an "alternative" Christmas gift for your "kikay" friend, do check out Aigoo Shoppe and choose among the many colors and designs that they are offering. Also, don't forget to drop by Aigoo Shoppe Online Facebook to check out what's their latest offers. Happy Christmas Shopping!